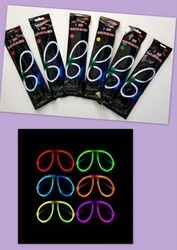 Glowing Eyeglasses for Glow-in-the-dark Parties and Events. Our Glowing Eyeglasses are individually packaged in attractive printed packing. Open the packing and clip the eye glass frame together. Bend the two glow sticks that are included, making sure you feel the inner tube break along the entire length. Insert the glowing glow sticks into the frame and in 20 seconds you have glowing eye-glasses.